architectural ruminations: Magic Chef Bldg. -- radiant heat advert. 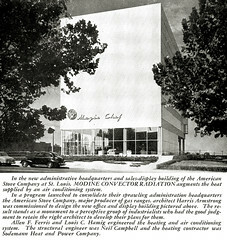 An advertisement for "Modine Convector Radiation", the radiant heat system installed in the Magic Chef Building, references the progressive, advanced design and technology employed in its construction. Armstrong had an enviable ability to promote of his work by capitalizing on advertisements featuring the products used in his buildings. The manner in which this is accomplished positively enhances a readers' perception of both the product and the architect.